Thinking about becoming your own boss and embarking on the wonderful and rewarding journey of freelancing? This book leads you through the entire process, from getting started, through to winning and keeping loyal clients. 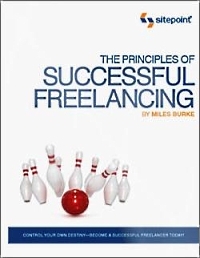 Running a successful freelance business is easy with the information in this book. Thinking about becoming your own boss and embarking on the wonderful and rewarding journey of freelancing? The Principles Of Successful Freelancing is for you. In this easy-to-follow guide you'll learn what’s important in transforming your skills into a booming freelance business. Understand the reality of freelancing, its advantages and disadvantages, and decide whether the freelancing life is for you. Go on a guided tour of the planning process essential to a successful transition into the freelancing lifestyle. Learn how your business finances, with a little forethought, can be kept in check. Everything you need to consider to be productive, happy, and healthy. Discover how to create your brand, develop your unique selling position, understand the sales process, and overcome your fear of selling. Learn the basics and the benefits of providing great customer service. Ensure your long-term well-being and engage with the world beyond your office walls.